Beyond delicious and so satisfying! These are crazy good. After making them for the third time in as many months, I thought I should come here and let you know. 🙂 The first couple times I made them, I grilled them on the BBQ, and they were good but maybe a tad dry. I made them last night in a skillet and I think it made a huge difference – they retained much more juiciness that way. I am obsessed with Frank’s Red Hot sauce, so I kept the bottle nearby and shook a couple drops onto each bite as I ate it. 🙂 My grocery store had pre-made, bagged broccoli slaw so that was easy – just mixed with light blue cheese dressing. I’m looking forward to leftovers tonight! These burgers and blue cheese slaw were delicious. All the flavors including the cheddar cheese make this dinner a huge hit.Totally recommend this whole dinner and I don’t even like blue cheese. Wow! Absolutely delicious! I have to be honest – my expectations for this recipe were pretty low. I thought, “It’s too easy!!!! Turkey, hot sauce, breadcrumbs?… psh!! !”But holy cow was I wrong! The burger was so juicy and flavorful, I kept saying, “OMG this is amazing” after every bite. First: I think I’ll be adding shredded carrots to every burger recipe from here to eternity.Second: The 1/4 cup of hot sauce was spot on. I like a little more heat to my food, so I added a wee bit more to the bun and was over the moon. My hubs on the other hand didn’t add any to his and was still happy with the flavor.Third: I used Boathouse blue cheese dressing and it was absolutely perfect.This baby is going in the rotation for sure. Trust me, you wanna make this one. 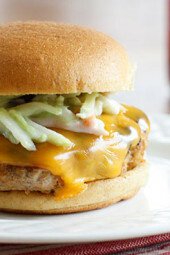 Any ideas on how to cook the turkey burgers in the air fryer? I just got one and I’m obsessed! Yes 370F about 15 to 17 min. Sorry, I don’t have that info handy. Is there a recipe for the broccoli slaw somewhere? I searched it on the site but can’t find it! 1. In a medium bowl combine broccoli slaw and skinny blue cheese dressing. Set aside. Broccoli slaw is sold in a bag. It’s broccoli stems cut into slaw. Great! 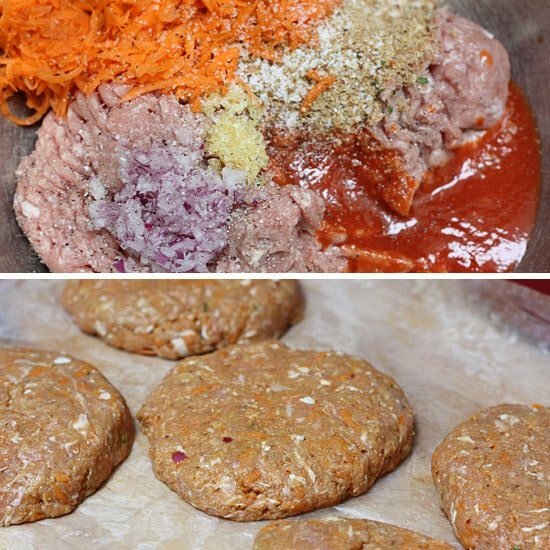 Turkey burgers can be pretty dry, this was not and such a treat… I love this recipe! Do the calories include the bun as well? I didn’t have enough ground turkey, so I used some italian chicken sausage and the mixture was really good too. This is one of my favorite go-to recipes! These were absolutely delicious and so easy to make! What a great flavor combination and they stay so moist. I will definitely be making these again! I just turned these into buffalo turkey meatballs and they are so good! Instead of grilling I baked for about 20 minutes and I added a little blue cheese in the middle. We also were out of Frank’s Red Hot so I used Sriracha. How can I subtract the cheese and the bun from the smart pts? Thanks!!! I love your recipes! Made these for dinner tonight and lived them! Thank you for keeping me on track with healthy recipes that are wonderful!!! has anyone tried making these with blue cheese IN the burger? I just made these and they were absolutely delightful! I was a little skeptical, but I was proven wrong quickly! Next time I will add more Red Hot as I LOOOVE Red Hot! Thanks for another delicious meal idea! I made these tonight and they were amazing! I love your recipes! As a weight watcher it is so great to know I can come here anytime and find something that won't break my points and tastes delicious! Amazing. Just made the patties–used 2 tbsp sriacha and only 1/4 cup crumbs. Did them on BBQ on a layer of tinfoil. Delicious. Made 5 patties and they were 123 calories each, without the toppings…amazingly low for burgers, and delicious. The carrot kept them moist. My daughter added them to her top 10 list! Thank you! Made these last week, they were amazing; used OPA brand blue cheese dressing, which is a greek yogurt-based, low fat dressing. Followed the recipe exactly and it made 6 HUGE burgers, (not complaining!). My teenage son ate one cold for breakfast the next morning!! Thanks for a great recipe. Made these last night and they were AMAZING!! 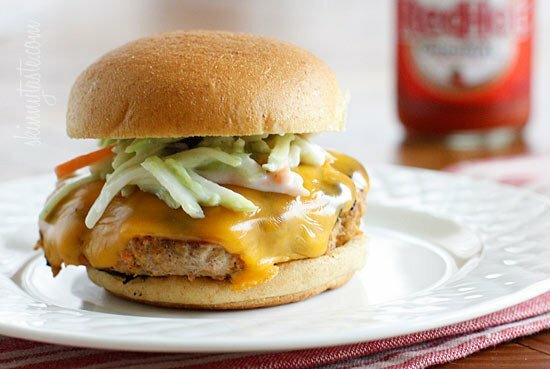 I've been looking for ways to spice up a boring turkey burger! This recipe was perfect. And the slaw was a great touch as well! Made these last night. The burgers were really good. We only used about half of the hot sauce it called for. Too much for us! I will say that the burgers took longer than 4 minutes per side to cook all the way through. I ended up tenting them with tin foil to get them to cook through. The broccoli slaw we were not a big fam of. Too tart and tasted too much of the blue cheese. Would need to fina substitue. Overall I would make these burgers again minus the slaw. Nice post. Making the bun yourself might be healthier, but it takes more time. Thanks for posting. I've had many turkey burgers in my day but these are the best! Even the boyfriend approved. Thanks, Gina! Another Skinnytaste success! I made these last night and the hubby and I loved them! I do wish I'd read all of the comments before I cooked them, as I would have reserved a couple of portions for the kids BEFORE adding the Frank's hot sauce. They were WAY too hot for me to even give the kids, but that's what hot dogs are for! 🙂 Another keeper Gina, thank you! Will be making this for dinner tonight! Looks delicious! There was a question asked about a year ago and I don't know if it was answered and I just missed it, but can you use ground chicken instead of turkey? And thanks for all of the great recipes! I can't believe it took me so long to find your site! I've been on WW on and off for years after having my kids and it's the best site ever! Hope to see you around the 'hood one day soon! Hello skinnytaste! writing all the way from australia!! I must say – i have been using your site for a few months now for healthy dinner options and i am absolutely loving everything i have tried thus far! no disappointments!! i made these burgers last night (without the slaw because i think turkey burgers was enough of a shocker for the men in my life to make them eat broccoli coleslaw as well!!). i doubled the recipe (10 burgers…hungry boys) and fed them to my partner and his best mate, both of which swore up and down that they would never eat a non-beef burger. My partner came back for seconds and made sure i packed the leftovers for his lunch, and his best mate went back for thirds. amazing burgers! 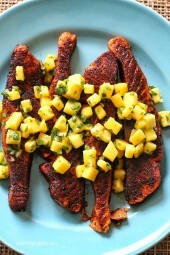 thanks so much for this recipe…im sure it will be on our summer nights list many many many times over!! My house loves this recipe. I have made them 3 times and my 5 year old eats a normal sized one all gone and is asking for more. 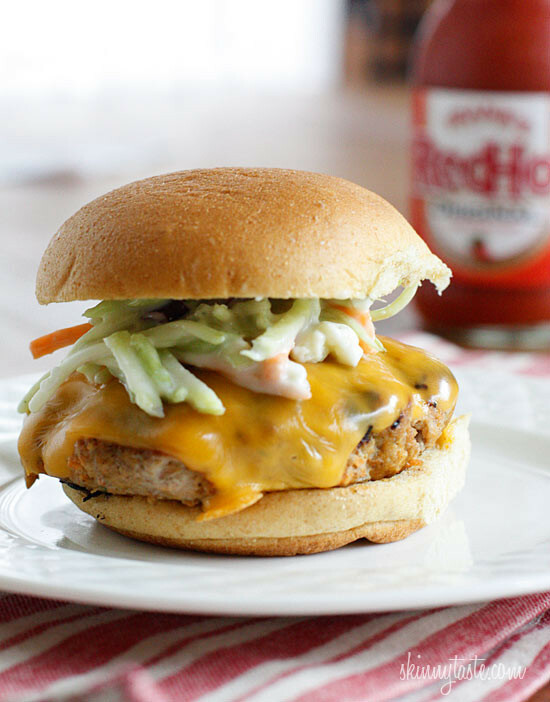 This is the best turkey burger recipe I have ever made! I live alone so I made 2 (one for today, one for tomorrow) and froze 3! I doubled the onion and garlic, and used low fat blue cheese yogurt dressing for the slaw to save some money and skip steps. Worked out well! These are INCREDIBLE! One of our absolute faves. However, no matter what I do, the burgers crumble and fall apart. I put them in the fridge last night for an hour after mixing – it helped some, but a few still crumbled. Anyone have any ideas? Does this happen to you? this does not happen for me…try lessening the amount of breadcrumbs? i used just under the required amount with no dramas! My family isn't a fan of ground turkey BUT my son took one bite and said "Is there more?" This isn't only the best turkey burger I've had, it's one of THE BEST BURGERS I have had! If you're afraid of it being too spicy, don't be! I do not do spicy at all and this wasn't very spicy. It is SO moist and juicy…we absolutely loved it. Thanks for another hit recipe Gina! 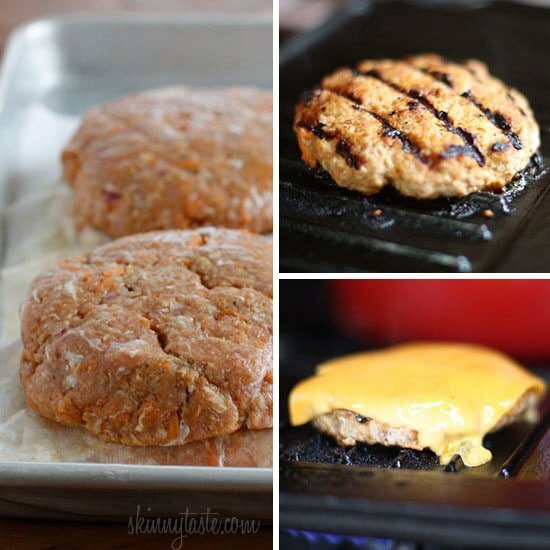 These look like the best turkey burgers ever! Cannot wait to try…and so perfect for this time of year. Keep the awesomeness coming! Just made these last night on the grill and they were delicious! I love the idea of using shredded carrots in the mixture. My picky boyfriend even gave his seal of approval! Thanks for another great recipe Gina! We eat these a lot, my family loves them! I usually serve them without the bun and add more of the broccoli slaw. So yummy! Gina, I have been following your blog for about a month now. I decided back in February to adjust to a healthier, whole food, lifestyle. Your blog has been a God-Send!! I am so thankful for what you have done here. I was sitting here, eating a turkey burger tonight, and I just kept thinking, "There's no way this is under 400 calories." You have done something great here, and with your recipes and suggestions on your site, you have helped me to turn my life around. In about 2 months, I have lost a significant amount of weight, and you can accept at least part of the "blame". Thank you so much for everything you do. You and your recipes have changed my life. I am healthier than I have ever been, I have more energy, and can enjoy life again. Thank you, from the bottom of my heart. You should be proud. 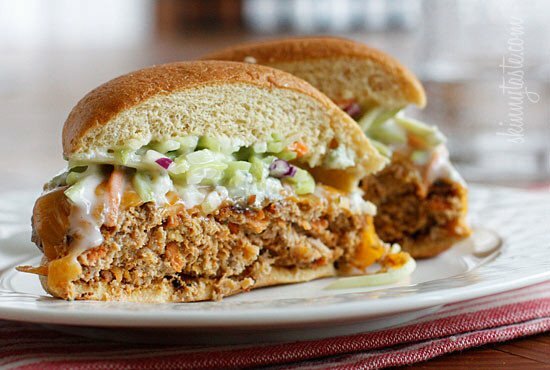 Love this idea – we are burger (and buffalo sauce) fans so this is right up our alley. I like your idea of adding veggies to meat to increase vegetable intake – I'm guessing zucchini would be another good addition that would not be too overwhelming. 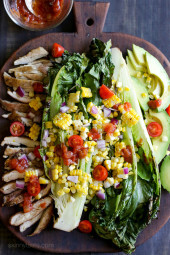 This recipe looks PERFECT for summer and barbecues on the grill. I'm going to try it out very soon! Made these today, very tasty, but I should have made mine smaller, they are also very filling. These were amazing. To save some time I just bought the carrots shredded and used Bolthouse yogurt blue cheese with the broccoli slaw (same calorie-wise) and the whole meal was just perfect. The boyfriend ate two. So delicious! I love spicy foods and have a hard time eating healthy. This burger gives just enough kick and at less than 400 calories you've won me over. Wowzer! These were AMAZING! I made a couple for my kids before I added the buffalo sauce (2.5 & 5-not into spicy yet!) 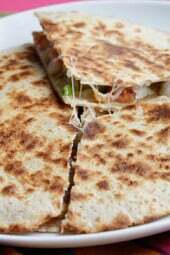 And added the hot sauce for us–hubby and I LOVED it! The BC dressing and slaw are equally amazing! Thx for ANOTHER craveable recipe!!! I added a celery stalk to the food processor w the carrots (that whole wings w BC dressing and celery sticks thing). Delish! These were fabulous! Made them for the 49r playoff game. My husband's comment, "you hit it out of the park". I think he has his sports games confused. Served them with your sweet potato fries. Yum!! Thank you. First off- how ingenious to hide carrots in the burgers?! Second- my husband said these were the best burgers he has ever had. I used what I had on hand and so I made a couple of changes. Did 1/2 lean ground beef and 1/2 turkey, used BBQ sauce instead of hot sauce, and added sauteed onions to the burger. Absolutely delish.